Dallas Cowboys quarterback Kyle Orton (18) reacts after throwing a pass for a loss of yards against the Philadelphia Eagles during the second half of an NFL football game, Sunday, Dec. 29, 2013, in Arlington, Texas. Finally, a little redemption for Tony Romo. While the Cowboys’ $100 million man watched the game on TV, another Cowboys quarterback threw a costly interception with the season hanging in the balance. 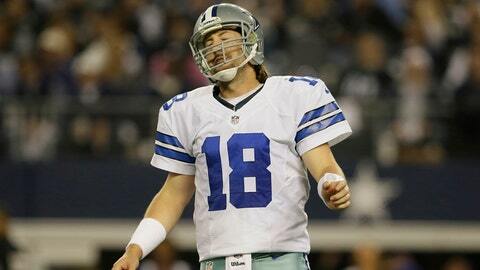 Kyle Orton had completed 30-of-46 passes for 358 yards and two touchdowns. For a man who’d thrown his last regular-season pass in 2011, he exceeded all expectations. But with 1:49 left in the game and the ball at his own 32-yard line, Orton uncorked a pass across the middle that was intercepted by Eagles cornerback Brandon Boykin. It set off a wild celebration along the Eagles sideline, and it meant the Cowboys would miss the playoffs for the fourth consecutive season. It’s not like this team was built for a playoff run anyway, but good luck convincing Jerry Jones of that. One man’s trash is another man’s 8-8 season. If you expected Jones to flash any anger after Sunday’s loss, you underestimate his capacity for delusion. He was incredulous at questions about head coach Jason Garrett’s job security, pointing to the answer he’d given six weeks ago. "I’ve said that a month ago, so I stand by that statement," said Jones. Oh joy. Jerry explained that he’s invested too much time (and anguish) in Garrett to give up on him now. He then made reference to another Cowboys head coach who got off to a slow start, but ended up becoming a legend. And though he didn’t provide a name, I’m pretty sure he was talking about Tom Landry, not Jimmy Johnson. It was a silly reference to make in the aftermath of a third consecutive .500 season. Jones certainly wants Garrett to succeed, but the driving force behind sticking with him probably has more to do with the fact he has another year left on his contract. Defensive coordinator Monte Kiffin will likely be urged into retirement, although his unit performed reasonably well against the Eagles on Sunday. Eagles quarterback Nick Foles was 17-of-26 for 263 yards and two touchdowns, but he was sacked five times. Defensive tackle Jason Hatcher awoke from his slumber to record two sacks and lead a spirited performance. LeSean McCoy did finish with 131 yards on 27 carries, but the Cowboys weren’t nearly as awful on that side of the ball as they’ve been for most of the season. Orton connected with Dez Bryant for a 32-yard touchdown with 3:57 left in the fourth quarter to pull the Cowboys within 24-22. But on the two-point conversion attempt, Orton didn’t give Bryant a chance to make a play on a back-shoulder throw that was too low. The defense forced a three-and-out to give Orton one final chance. But the interception brought the game and the 2013 season to a close. The Cowboys will have to make decisions on players such as Miles Austin, DeMarcus Ware and Hatcher in the coming months. Hatcher may have been the team’s defensive MVP with 11 sacks, but it’s likely he will seek a lucrative free-agent contract elsewhere. "Life goes on," he said to me as he left the locker room. "You’ll forget about me in a couple months." Jones would be justified in firing Garrett for not being able to win an extremely weak division. Even the notoriously impatient Eagles fans prepared themselves for a rough season under first-year head coach Chip Kelly. Instead, they will host the New Orleans Saints in a wild-card playoff game next Saturday. Jones will take solace in the fact the Cowboys went 5-1 against divisional foes. But of course the one loss came when everything was on the line. As Jones held court outside the locker room, a reporter asked if he was "embarrassed" by another lost season. His answer tells you everything you need to know about this organization. "Would you get embarrassed if you were standing in this stadium?" Jones said. "â¦The answer is no." It was a scoreboard moment for a billionaire who basks in the glow of 91,000-plus showing up game after game. But the real scoreboard told a familiar story. And the ending is always the same.